Wireless power for charging gadgets has been among the more vaporous of developments we've been hearing promises of for years. While there are a few working instances of the tech on the market, its large-scale adoption still feels miles away. So the appropriate skepticism should be applied to this NY Times report claiming Intel will announce a major wireless power breakthrough today at the Intel Developers Forum, but the details do seem enticing this time around for one of the holy grails of the CE world soon becoming a bit more feasible. UPDATED: Pics of Intel's IDF demo from today have been added. Intel's work builds on the progress MIT has made with transmitting power through resonant magnetic fields. 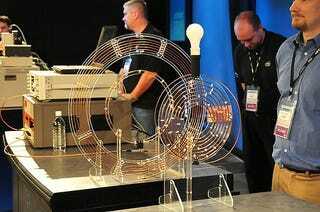 But where the MIT team, led by Marin Soljacic, has only achieved 50% efficiency over a range of a few feet, Intel is said to have recently zapped up to 60 watts over the same distance at an efficiency of 75%, which is quite a leap forward. Intel also is extrapolating potential uses of the tech for supercapicitors-basically giant electrochemical "batteries" that recharge almost instantly compared to Li-ion and store over a thousand times more juice than standard capacitors. Sounds good. We'll keep you posted on any developments from IDF today. UPDATE: Intel didn't tell us anything we didn't know already in their IDF demo today, which lit a lightbulb from a distance of a few feet by passing electricity between two coils. We were assured, though, that being in the middle of the electrically charge resonant magnetic field doesn't hurt one bit.